Get out your Flip Flops and your board shorts and get ready to enjoy Miami. Shirts are usually optional in the subtropical city of Miami so you may not need to pack too many. Do you have what it takes to enjoy life in Miami? 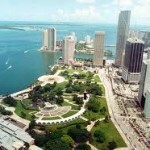 Truckrental.net has put together this informational article to help you decide if Miami is the right city for you. Miami is different than just about any place in the world. You may be saying to yourself, “I have been to plenty of tropical cities. I know what to expect.” If you have never been to Miami, then you will never know what to expect. Nothing will be able to help you prepare for everything that Miami has to offer, but this information will give you a great idea. Miami is a melting pot of different people and cultures. There is a huge Cuban and Puerto Rican influence on the city, and it has been combined with a Florida Cracker lifestyle and attitude. It may help to speak Spanish if you are moving to Miami. Leave your attitudes behind, because the people of Miami live a much simpler, less stressful life. From the moment that you set foot in Miami, you will see that the attitude is laid back and causal. Some cities may have a casual Friday, but the city of Miami has an overall casual lifestyle. Miami is considered by many to be a tropical paradise. Do you think that a lot of people would like to call Miami home? It is the eighth most populated city in the entire United States. The city of Miami is home to just over 400,000 people and the city and its surrounding areas are home to over 2.5 million people. The city of Miami is small in terms of size. It is only 55 square miles of land. That put over 12,000 people per square mile. If you are moving to Miami in search of a change of seasons, then you had better find some place else to live because in Miami, there is really only Spring and Summer. There is a Winter period, but it rarely gets below 55 degrees. Miami weather is considered by many to have the perfect beach weather so make sure that you pack plenty of bathing suits. If spending your days on the beaches of Miami is not enough, then you will love Miami when the sun goes down. Miami is known all over the world for having some of the best five star nightlife. You will never have to go very far to find a great party. Miami has a lot to offer its visitors, and a lot of Miami visitors quickly try to find a way to become a permanent resident. If you are thinking of moving to Miami on a whim, then you may want to spend some time there on a vacation first just to make sure it is a good fit.